You know what hay in your underwear feels like. You love a clear night and a full moon because it makes it sooo much easier to find a horse in the pasture. You know the difference between a 'hot' electric fence, and one that's set on "hoof-melter," based on feel. You'll drop $80 on shoes for your horse...but buy yours at Goodwill for $2.50. You use your garage to store jumps because your truck won't fit. You've ever walked thru a pasture in high heels during your lunch break to check on a horse. You accidentally clean your bathroom with Leather New because you think it's orange cleaner. You remember a horse's name better than a person's. You've ever used a - screwdriver, scissors, sweat scraper, other horse shoe... - as a hoofpick. The difference between an inexperienced rider and a bad rider...is the inexperienced rider will ask a horse to do something in a way he does not understand, and forgive him when he does not perform. The bad rider will do the same and get angry. 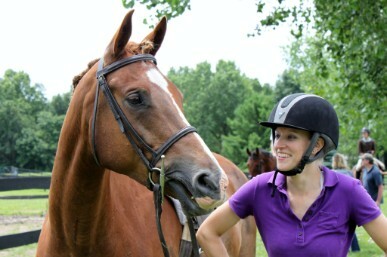 The second you tell a potential buyer, "this horse has never been lame," the horse will go lame for the first time. You've used a potato scrubber or your daughter's toothbrush to clean bits the night before a horse show. DO YOU HAVE A BIT OF HORSE WISDOM?? EMAIL US NOW! IT COULD MAKE IT ON THE BOARD THIS MONTH!